Co-operative Education is a structured and formalized program that integrates a student’s academic studies with relevant, quality work experience. Co-op students alternate study terms and work terms in appropriate fields of business, industry, government, social services and the professions that offer suitable learning situations. The student’s progress is monitored by the Co-operative Education office and their performance on the job is evaluated by the student’s employer. What are the benefits of hiring a co-op student? Motivated, bright and eager co-op students provide a cost-effective alternative to your short-term hiring needs. Co-op students are available for four, eight, twelve and sometimes sixteen months to assist with special projects and increased workloads and can start their work terms in January, May or September. Co-op student salaries are generally less than those of regular employees, and UBC’s Co-operative Education offices support the co-op recruitment at no cost to organizations. Many employers identify future hires by assessing organizational “fit” during these work terms. What UBC faculties participate in Co-op? 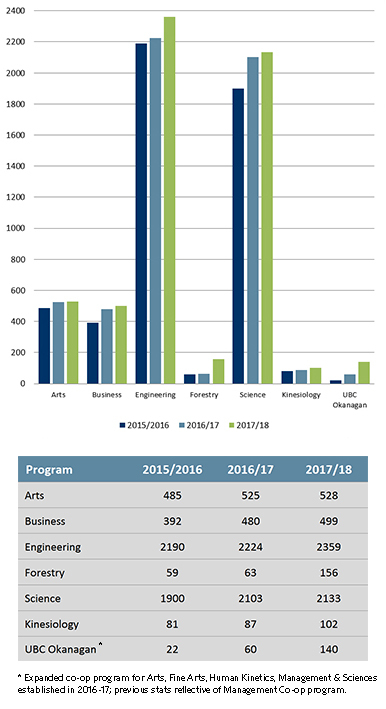 The UBC Co-operative Education program has grown to be the largest program offered at post-secondary institutions in British Columbia with over 4000 annual work terms. Co-op students are available in programs offered by Arts, Business, Engineering, Forestry, Kinesiology, and Science.